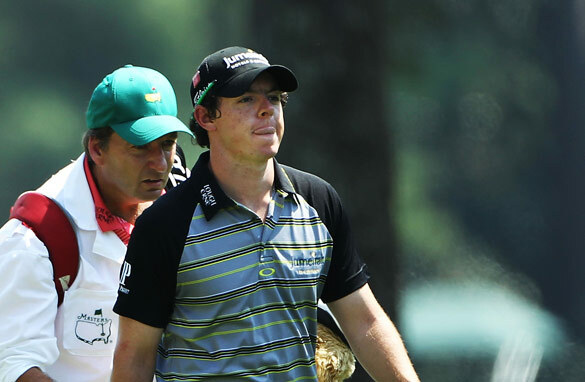 Rory McIlroy saw his game disintegrate in dramatic fashion in the final round of the Masters in Augusta. Poor old Rory McIlroy. Any golfer with a modicum of emotion, from club hackers to seasoned pros, would have had a sympathetic thought for the young maestro from Northern Ireland, as his game crumbled in dramatic fashion in the final round of Sunday's Masters in Augusta. Golf is a pursuit that demands mental strength and positive thinking for success - it's played 90% between the ears as the cliche goes - even at the very lowest levels of the games. If there is a player alive who has not experienced the exasperation and frustration of a how a duff shot can ruin a perfectly enjoyable day on the fairways I would like to meet him. It's galling enough for it to happen when you are playing among friends, but in front of galleries of thousands of fans, alongside the world's best players and whilst it is being broadcast around the world to an audience of millions? That's a tough situation and a lonely place to be. So how could it happen? How a man who hit a 65 on his first round - a shot less than Charl Schwartzel's blockbuster final-day tally - and who had led for so long see his will turn to dust over three heart-breaking holes? Well, there is a theory, espoused by Matthew Syed in his book "Bounce: How champions are made" that McIlroy's downfall was a simple case of thinking too much. The argument goes that in sport, players excel when they are in "the zone," or more specifically when they are playing without thinking; letting their subconscious - the area of the brain that has been disciplined through years of practice - do its thing. However, pressure can scupper this ideal scenario. When confronted with the fact that by playing nine more holes you could become Masters champion, the concious mind awakens and kicks into gear. These next few holes will be life changing, the concious thinks, so let's have more of a say on the shots we're about to hit. And it is when the concious mind takes over that things start to go wrong. McIlroy admitted in a post-Masters interview that he could no longer see the path to seemingly easy putts once his game had started to unwind on the tenth. He was no longer in the zone, his subconscious mind was now being overruled by a rational but clearly less accurate concious. It is this mental ability to stay in the zone that makes champions and fells cautious contenders. Such a capitulation is also something that is hard to erase from a fertile mind and can have a nasty habit of reappearing when least wanted. Just ask the likes of Australia's Greg Norman, who finished a Masters runner-up three times in equally dramatic and gut-wrenching fashion. McIlroy will be shaken after his experience and will need time to reflect. But to use another cliche, it is vital he concentrates on the positive going forward. His talent shone so brightly for three days in Augusta he was untouchable. A 21-year-old made veterans look like school boys and such talent does not disappear overnight. What's more, there is inspiration close at hand if Rory needs a pick-me-up. Phil Mickelson had been dubbed "the greatest player never to win a major", having finished second or third between 1999 and 2003. He seemed destined to be an eternal bridesmaid. But "Lefty" clung to a tiny, private thought; a ray of light within him that said he could one day win. And in 2004 he did, at the Augusta Masters; a victory which proved the first of three Masters triumphs over the next six years. McIlroy can bounce back if he follows the lead set by Mr Mickelson. Golf is a game of snakely swing of zeroing the flage,heavenly willpower of putting, fishing like relexing,and lady luck with the "pianoic sound' made by ball with golf club!!!!!!!!!!!!!!!! Golf: A good walk, ruined. I hope so, work up this morning (in Australia) hoping to see him putting on the Green Jacket. Looking, not 1st, 2nd, 3rd...I honestly thought, where is he. Heart sank when in heard 80. Pint of Guiness, a ruffling of the hair...get out there agian mate. A lot of people want you to win...for all the right reasons! Go Rory! Another good example is Mike Weir who shot 80 at the PGA while paired with Tiger but then went on to win the Masters. Rory has incredible talent and will win more than a few Majors before he is done. Everyone is overreacting to this. He finished 4 under – if he had shot 4 rounds of 71 we wouldn't be talking about this. The only thing unique about this situation is that his mistakes weren't more evenly spaced across all 4 rounds. That can happen at times but in the end things still average out. That why they play 4 rounds – to separate the wheat from the chafe and weed out those that have short bursts of brilliance in favor of those that are more consistent. Maybe now he will stop with that big mouth he has.Everything from tiger to the young guy are taking over.Now he must see how good Tiger must have beenall these years.It take a good man to finish what he start. So he didn't win a major at 21! What's the big deal? Kids want everything "yesterday", and the media feeds that desire for instant gratfication. How about they tell him to accept that he didn't have the right stuff just yet but will likely have it in the future - you know, when he's fully learned his craft. Bad luck Rory, but I'm sure you'll wear the green jacket one day when the time is right. While we may be defined by our successes, we are forged in our failures. The Masters is certainly a white-hot crucible and young Mr. McIlroy is a ductile piece of metal. He can become the tempered steel that makes the finest blade, he has only to establish his goal and set his mind to it. We saw the elements of a future Masters champion, it is up to him to accomplish according to his aspirations. I wish him well in his experiences. I honestly saw this coming.. that is how he assumed that talent alone was enough... he, with Poulter, started that 'mind games' war against Tiger, and as it turned out, talent alone was not enough... it was that something in between the ears, which needed to be tamed, when the heat got turned up... He could not handle the Augusta roars. Perhaps if he shows a little more humility now, he will have less of that 'self-brought on' pressure. This is the problem with most European players. For example Mr. "Stylish" Poulter. He has just as big a mouth as McIlroy talking trash to Tiger Woods. Look what happen to both of them. You should never take advantage of Tiger's situation. First of all Tiger doesn't have to prove anything. We all knew he is a winner. Just look at the record. The only reason he is playiing (you all be glad) is to erase Jack's record. He can do this without any doubt. If he is not playing, golf will be extremly boring. So here is my advise to all European player, Just don't talk against Tiger because it will bite you back. You guys are not even close to Tiger's record and you all are making fun of him. You have both #1 and #2 players that isn't even worth a flip in the recent "Master". Rory McIlroy is a talented young man but only time will tell whether he is as good or even half as good as Tiger Woods. In the mean time he should learn to be humble. Indeed it is only smalltimers who attempt to appear great through denigrating others.